If you pay by check add another 2%! *15% added upon sale; additional discounts added after order review. crystal, pewterware, and ceramic available for a Super Discount! ALL inventory of woodcarvings, pewter and more and get 33% OFF your total purchase. Use coupon code SALE33 at checkout! AND ONLY to the items LAST CHANCE menu . THAT's a possible 39% off with your purchase!! We have decided to concentrate on woodcarvings, pewter ornaments, & tourist gifts. These artisans have been responsive to us over the years and so we can guarantee quick delivery. That leaves these handcrafts to be closed out while supplies last. We offer seasonal promotions so please bookmark this page for future reference. We announce our sales here! But do not forget our wide selection of PEMA Woodcarvings including Nativity, Saints, Common Folk and more plus FREE SHIPPING on orders over $50.00. Woodcarvings go on sale in FEBRUARY and SEPTEMBER. Nativity sets are 10% off year-round. 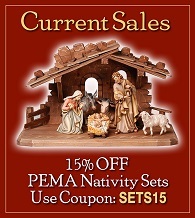 Use coupon code SETS10 at checkout for nativity sets. Even better, consider registering with us to receive offers by e-mail. Is your order over $50? Then, shipping is FREE for 3-5 day delivery (FedEx Ground & US Post Priority). There is a nominal charge for shipping to HI, AK, Canada and Mexico. 25% OFF FedEx and US Post EXPRESS if you need your gift in 1-2 days. Always remember! The price you see is the price you pay (details). We offer brochures direct from some of the craftsmen we represent, so please feel free to contact us or request a mailing. Thanks again for shopping AlmostEurope!